After ribbing #88 enough, the Spittin’ Chiclets hosts moved on to Reaves, and his dustup with the Capitals Tom Wilson. A former slugger himself, Bissonette who is friends with Reaves and Wilson, is convinced the two will connect once their careers are over. To which Reaves replied. Sure Reaves is the baddest man in the league right now, but after meeting Georges St. Pierre, #75 knows his boundaries. A big GSP fan in his own right, Fleury laughed with the Chiclet crew about his hockey bucket list. A fight, and a goal. This is the closest Fleury ever got to getting into a brouhaha in the pros. The roast was about 45 minutes long and is easily one of the funniest interviews you’ll hear. Because of the loose, raw nature of the podcast, Reaves, Schmidt and especially Fleury open up in ways you’d never expect. They are hockey players after all, so of course there’s plenty of off-color language. If you tune in, you’ll also get to hear Schmidt rip on quiet crowds across the league compared to the T-Mobile Arena. And Fleury answer questions about retirement. Don’t worry Schmidt begs him to keep playing. It begins :38 minutes into the podcast. 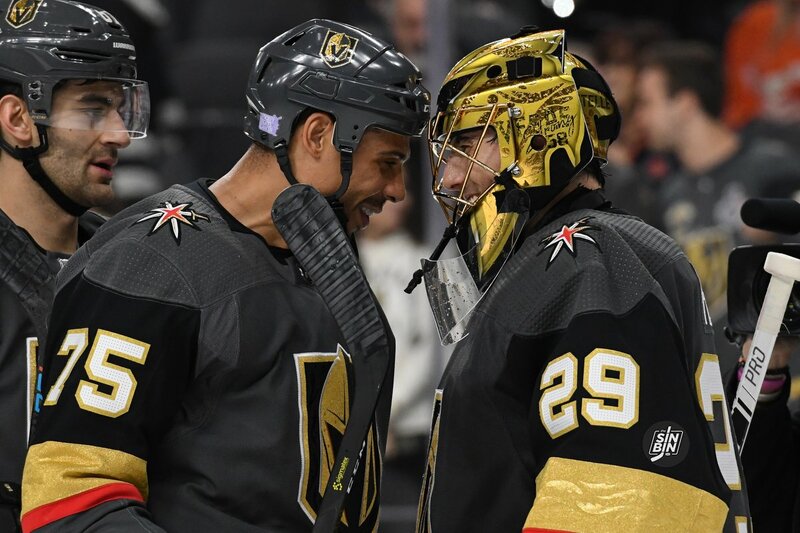 If you listen through this one, you’ll be a Spittin’ Chiclets fan for life… and a Schmidt, Reaves and Fleury fan for life. As if you weren’t already. Thanks for the recommendation. That was funny as hell!! Great to hear the players loosen up and be more themselves. Also, the guys doing the podcast are a hoot, especially Bissonette.